Unfortunately , Sportsman Acres Fellowship Church is Closed. This site remains online for archival purposes. Thank you. Welcome To Sportsman Acres Fellowship Online! Sportsman Acres Fellowship Church is devoted to presenting the Gospel of the Lord Jesus Christ to the world. We are blessed to have an atmosphere of God's love that you can feel as you walk through the door. We understand that not everyone has the luxury of time to come formal. No problem! Just come as you are, and expect to be changed forever for the better by the presence of the Living God! Sportsman Acres Fellowship is located at the entrance of Sportsman Acres. From highway 69, between Pryor and Chouteau, take 69-A to the east and go approximately 5-7 miles until you reach the A&A convenience store. Turn right (south) and the church is located on the south side of the building. Click here to see a map. If you are a first time visitor or have never signed the guestbook, please scroll down to the bottom of this page and honor us by signing, or click here. Thanks! 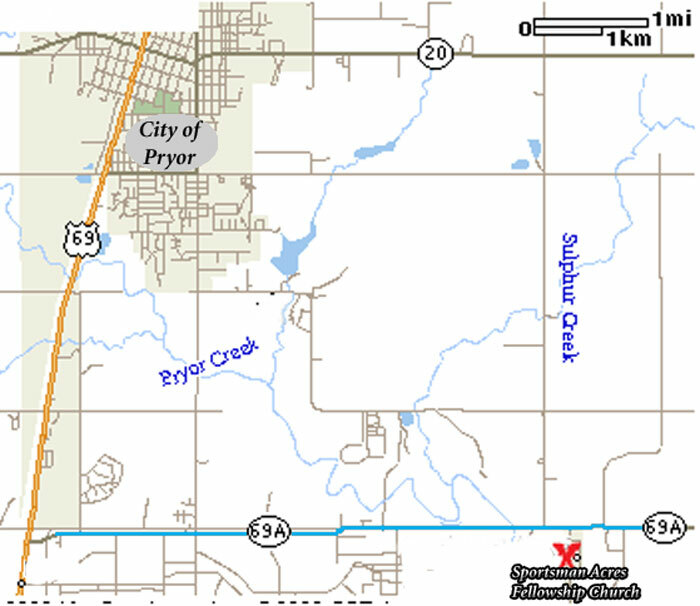 We are located just minutes from the Pryor Creek city limits. If you are from out of the area and would like more detailed directions, click here to email us.